There are no rooms available at Tara for these dates. Tara is an individual, architect designed contemporary house that is the perfect location for a large family retreat in St Ives. Tara has five bedrooms (plus additional study with double pullout sofa bed), an enclosed sun trap garden and on-site parking for two cars. 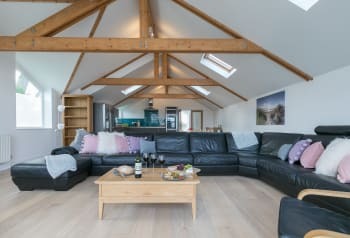 Set down a quiet narrow lane, bordering fields and just ten minutes walk from the St Ives Tate Gallery and the golden sands of Porthmeor beach, Tara allows guests to enjoy everything that St Ives can offer with the additional bonus of being able to get away from the crowds – the perfect destination to escape.